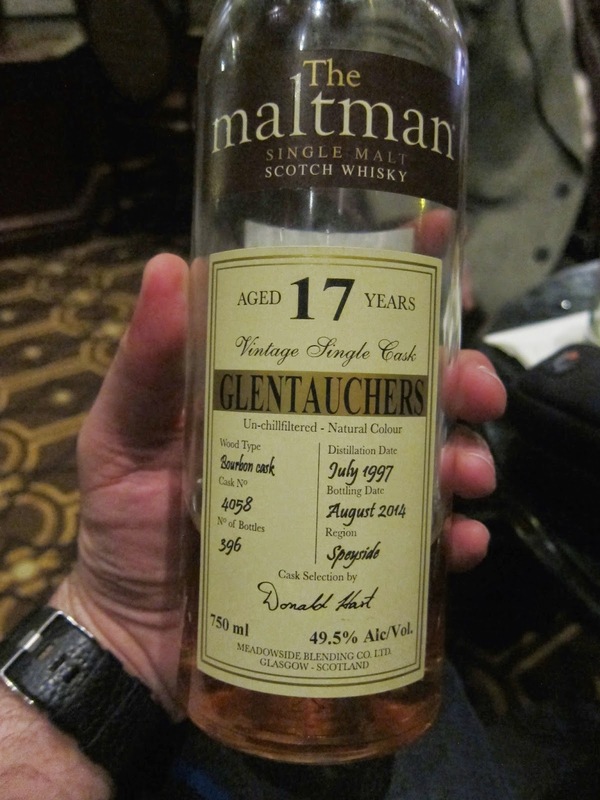 The Maltman Glentauchers 17yo (49.5%): It's been quite a while. Samples piled up and I am behind, way behind... I have a list of excuses but I will cut to the chase instead. What I have on my desk today is a 17yo. Glentauchers release from the Maltman line-up. The whisky is distilled in July 1997 and bottled in August 2014. It is aged in an ex-bourbon cask which yielded 396 bottles. Glentauchers is owned by Pernod Ricard and in spite of its very limited availability as single malt it is actually a decent size distillery with a capacity of 4.2 million liters per year. Most of the production goes into Ballantine's blends. Color: Oak aged Chardonnay. Nose: Fresh cut pineapple slices, passion fruit and guava. Cold pear compote, kumquat and pine needles. Butter and crispy dried malt. Rubber bands and old glossy magazines. Water brings up some earthy aromas: wine cellar mold, black garden soil and wool. Palate: Sea salt, oatmeal cookies and wool scarf. Warming and spicy. Honey, marzipan and nutmeg. Adding water kind of made the texture a little too thin for my palate but added some nice piney notes though: pine resin, tree bark and pine cones. Finish: Perfect amount of wood tannins lingering as long as you can tell; tongue tingling. Subtle allspice, cinnamon and dried lemon zest. Overall: Well, I liked it of course since I am a fan of ex-bourbon only matured drams. It is fruity, citrusy and warming. Clean, refreshing, simple and tasty. Anything I can ask for... A bottle you would like to have home for the times when you don't want to be adventurous and just sip a good whisky. I have to say in general I really appreciate the barrel choices of The Maltman team. Thanks to Brad Jarvis a.k.a The Whisky Professor for the sample.